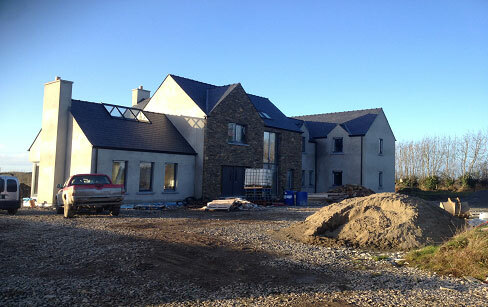 We built this 300m2 Solar Enhanced Passive House for Declan Matthews in Castlebellingham in 2012. It was pre constructed in our factory in Cahir Co Tipperary using our revolutionary twin-stud timber frame method, reducing cold bridges, material costs and increasing performance. The house arrived on site pre-finished to substantially reduce construction time, waste and costs. 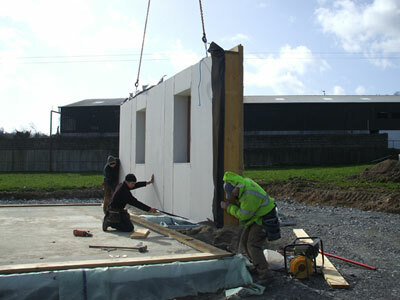 Munster Joinery Alu Clad Passive House windows were used in the house. 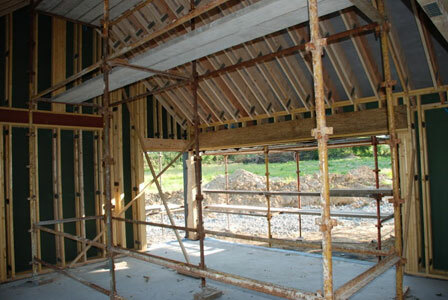 The twin-wall stud is filled with 300mm of Irish EcoCel Cellulose Insulation manufactured from Irish Newspaper, this is a reuse of material that would often go to landfill and the carbon in the paper is preserved for the 100 year life of the house. It's lined with OSB board manufactured in Waterford using Irish timber. The wall, floor and roof U-values are between 0.10W/(m2.K) and 0.12W/(m.K), the airtightness test was 0.48ACH@50Pa. 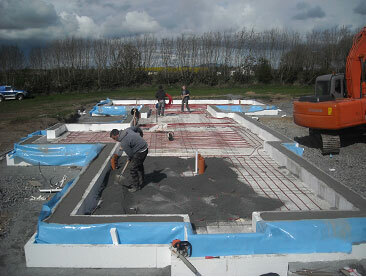 Our Cold Bridge free Passive Slab foundation system is produced by Airpacks in Cavan, it's twice as fast to build and uses 60% less concrete than traditionally constructed foundations. The PHPP energy demand calculation shows a heating demand of 14kWh/m2.annum which is fully satisfied by the solar array. The house has no back up heating system as excess solar heat is stored inter-seasonally in the insulated sand/gravel insulated Solar Slab beneath the house. 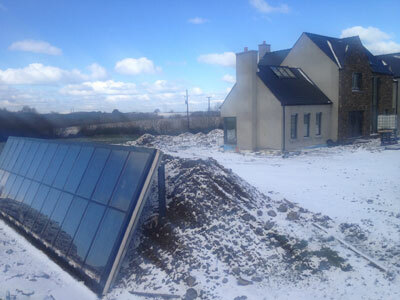 Due to the low heat demand of this super-insulated Passive House the 60m2 Solar Array is sufficient to provide hot water and heating even in December. The only bills are for lighting and running the A rated washing machine which takes hot water from the cylinder heated by the 60m2 Solar Array. There's no glycol or heat exchangers in our solar heating system so no glycol has to be disposed of every 5 years. Hot water from the roof is pumped directly into the floor slab, when the solar array gets too cold or too hot the pump stops and it empties automatically back to the drain-back tank. 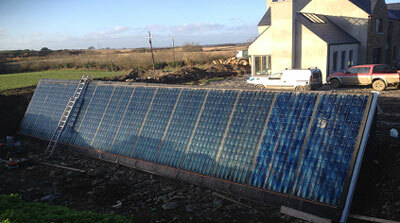 The Solar array was manufactured onsite by our own plumbers; the fins were imported from Germany. Our solar heating system harvests heat at 25 degrees, so we can harvest 35% more energy/m2 in December than a system harvesting at 50 degrees. The best angle for winter heating is the latitude plus 15 degrees so the optimal pitch is 67 degrees for solar heating in Ireland. In solar vacuum tube systems there are 3 heat exchangers and each heat exchanger loses 5 degrees due to heat exchange inefficiencies, so to get 25 degree water into the floor slab you need 40 degrees in the vacuum tube, this increases losses from the array. It came in within his �245k budget; this includes the kitchen and solar heating system. The house has level access and bedrooms on the ground floor and is large enough to house his own family and his parents if the situation arose. The water comes from a well on the farm.